Chelsea are plotting hard to make several late swoops as the transfer window closes in a week and have been linked with a host of players. One of the players linked to the Blues in the past few days have been Welsh star, Aaron Ramsey. The centre midfielder is yet to commit his long-term future to the Gunners despite having less than 12 months left on his current contract. This has led to several speculations that Arsenal are willing to cash in on the player than losing him on a free next summer. Arsenal doesn’t want a repeat of last season debacle involving the contract situation of Alexis Sanchez which led to his exit to United. 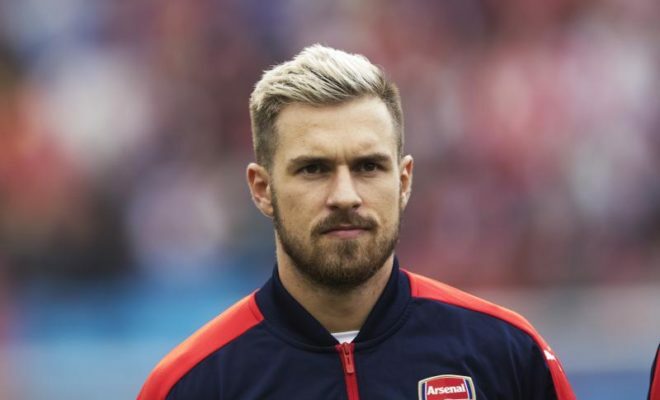 Ramsey is one of the oldest member of the squad having arrived from Cardiff city in the summer of 2008 and become a fan’s favourite during his time at Emirates. Chelsea and Liverpool have been alerted to the midfielder’s situation and are ready to take a punt on a transfer this summer. It is believed that a fee of £35 million should be sufficient for the Gunners to sell their highly prized asset this summer. Chelsea are preparing a bid for the midfielder who has scored 59 goals and created 57 appearances during his 10-year stay at the Emirates. New manager Maurizio Sarri has spoken of his intent to add an extra midfielder to the team and Chelsea board believes that Ramsey fits the bill. The transfer would be an interesting one to watch over the next few days as it unravels.